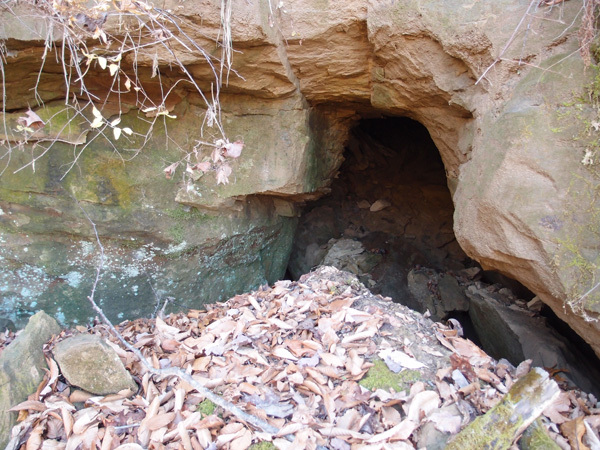 This tunnel, fairly short, is south of the Cawood KY tunnel on Bob’s Creek at 36.766159, -83.242214 (this is the north portal. The south portal is unfinished). 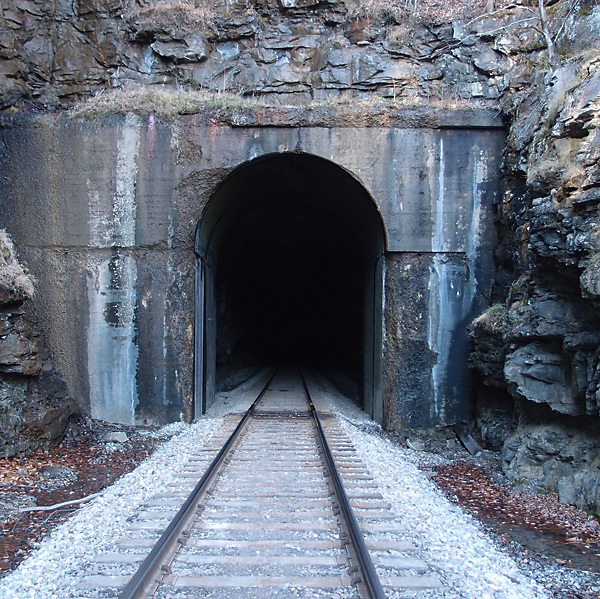 A man who lives near this tunnel, after checking our religious credentials (we lied)(sorry), confirmed that the 1929 date on the tunnel is consistent with the building of this line. He also regaled us with stories of at least four people who died on the railroad for various reasons (drunk, stupid). That stuff rolls off our backs like duck water. 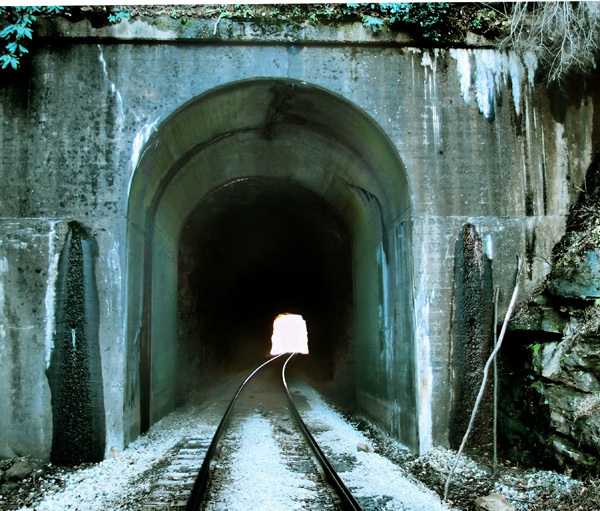 This is the southerly portal of a long, 1/4 mile or so, tunnel on the CSX near Cawood KY. Anecdotal evidence (I’m still doing research) indicates that this line was laid down in the late 20s, but the date on this portal, if there ever was one, has been eroded away. This portal is at 36.77949, -83.24325. A picture of this on Google Earth is titled as being near “Bob’s Creek”. Not my creek, no sir. Between 1924 and 1931, a narrow-gauge railroad hauled coal from the Crummies Creek mines to a prep plant on the other side of the mountain on Cemetery Road near Crummies, KY*. This portal, probably dynamited and then filled in, is near 36.78559, -83.21749. Good luck trying to find it on Google Earth. We nearly missed it ourselves. When I took this picture, I was standing on top of the fill looking into the tunnel right at the top. I could feel cool air blowing out, so the tunnel’s not completely filled in. On the prep plant side, there were several L&N lines that used a double-track loader. The tracks are gone now. *The Kentucky place name list tells me that a “crummy” or “crummie” refers to an animal that has crooked horns. For the last few months, I’ve been recording the train depots (if available) and the post offices of many of the small towns we drift through on any given Sunday. Both the depots and the smaller post offices are slowly going away; the former from neglect, the latter through an excess of penury on the part of the USPS. 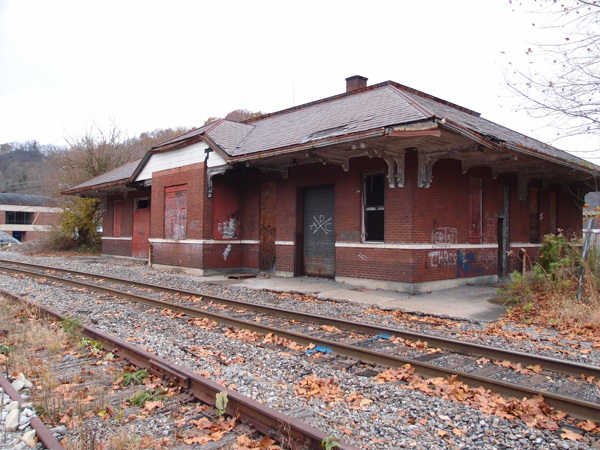 Here are two standard issue, well-built train depots that have fallen into ungraceful disuse. 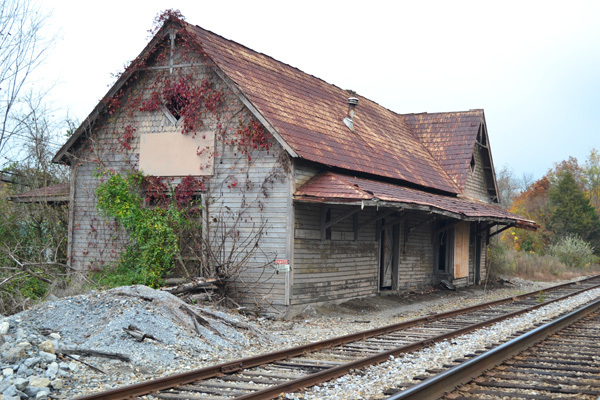 First, here’s the Appalachia depot, on the L&N. And this is Limestone’s depot on the N&S. It was, at one time, a stylish building. No longer.